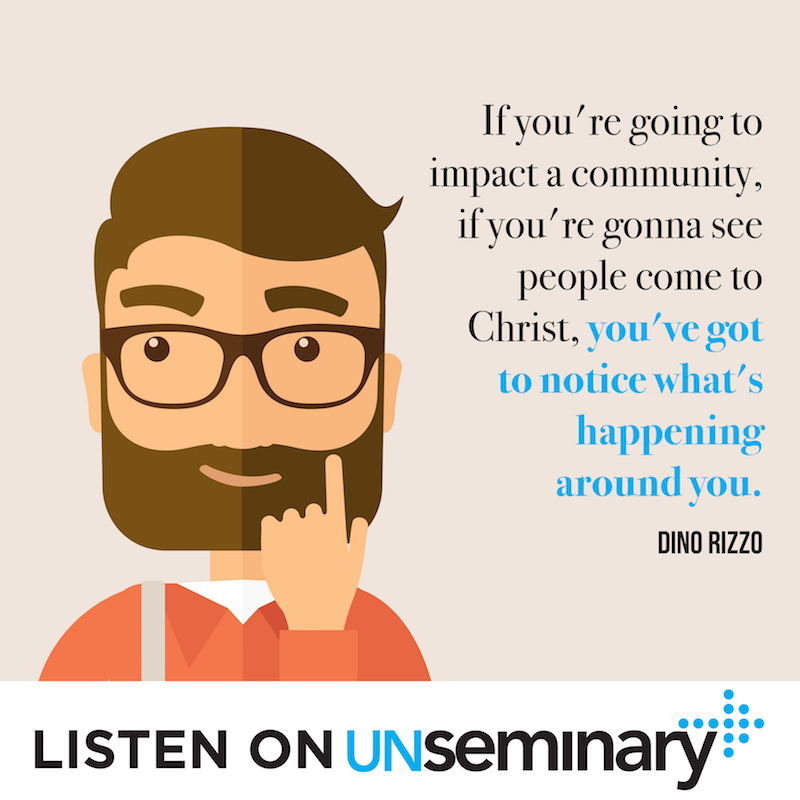 Hey, everybody, and welcome to this week’s episode of the unSeminary podcast. Thanks so much for spending time with us today as we speak with Dino Rizzo of ARC, the Association of Related Churches. He’s also an associate pastor at Church of the Highlands. ARC began as a conversation about how great it would be if these pastors came together and planted churches already with a support team rather than having to figure it out all on their own as each of them had. Dino and his wife planted a church in 1993 in Baton Rouge and started with no one and no money. The idea and mission of ARC sounded great to him in light of his own beginnings, and so Dino jumped on board helping others live their dreams of planting churches. There are a lot of steps in the process of starting a church and a lot of things can derail that dream along the way, so Dino talks with us today about some of his tips for successful ministry and church planting. Step out and connect. // It can be difficult for a pastor to find someone within his own church members that he can really connect with and trust. Having a trusted relationship with other church leaders is key, but developing that can be difficult. “You have to put yourself out there,” Dino says. “It’s got to have a covenant feel to it.” Don’t wait on someone to mentor you, step out of your closet and connect with others; don’t let yourself be isolated. Do an inventory. 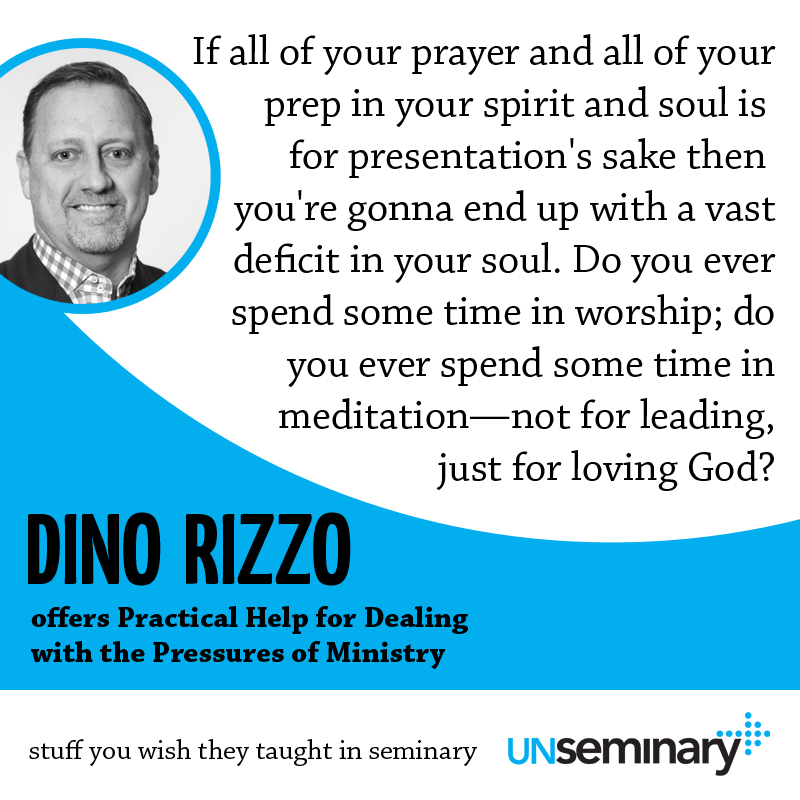 // If you’re feeling out of balance in your own leadership or spiritual life and need to reach out, Dino first recommends that you do an inventory. Ask yourself, “How’s my soul? How’s my spirit?” Ask your wife and your kids how they would describe you right now, or else someone very close to you personally. Check your calendar. Are you truly honoring the Sabbath? Do an honest appraisal of yourself and your spiritual life. Is everything you’re doing about presentation, or is it really about honoring Jesus? Have you taken a day off and prayed and studied just to enjoy God? Spend time just worshipping God through prayer and studying His Word, rather than always be focusing on leading and prepping for the next thing. You can learn more about Dino by contacting him at [email protected] and ARC at www.arcchurches.com. 00:36 // Rich introduced Dino Rizzo and welcomes him to the show. 01:09 // Dino introduces us to ARC. 03:14 // Dino talks about the importance of community and conversation. 05:10 // Dino talks about making connections and waiting for them to happen. 06:38 // Dino suggests ways to connecting relationally. 08:02 // Dino tells us how to stay healthy in the face of growing demands. 11:20 // Dino talks about the importance of keeping balance in our lives. 13:27 // Dino talks about combing service and evangelism. 16:00 // Dino highlights the importance of resourcing oneself. Ministries Following // Bobby Bogard, Mike Guzzardo, Pastor Brian at Hillsong, Furtick, T.D. Jakes. Influential Book // Books by Patrick Lencioni. High Adventure in Tibet by David V. Plymire. In the Heart of the World by Mother Teresa. What does he do for fun // Hangs out with his wife. Spending time with his friends. Rich – Well hey everybody, welcome to the unSeminary podcast, my name’s Rich, the host around these parts. Every week we get great leaders on to help wrestle through some practical issues that you face in your church and I’m just so glad that you’ve decided to spend some time with us today, to pop us in your earbuds. Today we’ve got a great guest on, Dino Rizzo from ARC, Association of Related Churches. He’s also an Associate Pastor at Church of the Highlands, once of those fantastic churches. We’ve had a few leaders from Church of the Highlands on, I’m just so glad you’re on the show today Dino. Dino – Thanks so much. It’s a real honor and I appreciate you. Rich – That’s great. For folks that don’t know ARC, Association of Related Churches, it’s really a church planting, church support organization started by 6 pastors about 15 years ago. They’ve launched literally hundreds of churches. How many churches are you up to supporting now? Dino – We’re right at 566, which is kind of exciting. It’s been a fun couple of years watching it grow. Dino – It’s 15 years old. Our found was Billy Hornsby, we call him The Biscuit from Louisiana and he was just a great man and he put us in the right trajectory. He passed away a couple of years ago but he’s still in all of our hearts. Rich – Nice, very cool. Well why don’t you tell us about ARC and then tell us a bit of the Dino Rizzo story? Dino – ARC began with a conversation that Billy Hornsby and Greg Surratt had. Pastor Greg Surratt there at Seacoast. He’s my boss and it was just a great conversation about what could it be like if we came together and helped plant churches, where we didn’t have to go through it the way all of us did? My wife and I, we planted a church in 1993, Healing Place Church in Baton Rouge, a pastor for 20 years, and we started with nobody and no money. So I was brought into a conversation then along with Scott Hornsby and then we said, “Let’s plant some guys.” So the first two guys were Chris Hodges and Rick Bezet. They planted on the same day, that was 15 years ago. So it’s been a lot of just learning. Our office is here in Birmingham now. We’ve got a great team, a great staff and we do a lot of assessing, a lot of prelaunch coaching, a lot of conversation as relates to resources and building a launch team and what does your experience look like and what does your prayer base look like and how are you putting together the different aspects of ministry and stuff? It’s a lot of fun, we’re just having a blast helping couples live out the dream in their heart. Rich – I know you obviously have a great perspective, you influence a lot of church leaders, you get a chance to see a lot of different church leaders and in your own kind of journey, when you look back, as you’re coaching and leading leaders, what would you say are some of those demands that come onto church leaders, that maybe derail or push them in the wrong direction? What does that look like for you? Dino – There’s so many and a lot of them are self-imposed. I know I went through a time where I derailed a little bit and just tried to sort things out. If you don’t have good friends, if you don’t have a good pastor, if you don’t have people in your life that you can bounce things off of, I mean sometimes we feel like we’ve got to have the answers to everything and we’ve got to be the man and it’s hard to raise your hand and say, “I have a question,” or “I don’t feel good,” or “Can I go to the bathroom?” So we just stay stuck and sometimes we’re unhealthy and we’re overwhelmed and we’re stressed. So I think watching great leaders and communicating with leaders and going through the ups and downs… One thing I love about ARC is, we have a group of friends, we’ve been friends for a while and we’ve been through the ups and downs, the good, the bad and the ugly and at the end of the day we need each other, we can’t isolate, we’ve got to be willing to sit at a table with people that are not impressed with us, that will ask hard questions and then if we’re not doing well that they’ll let us in a safe harbor, get healthy. Whether it’s our marriage, or dealing with our kids, our money or just own personal pain or personal defeats or sometimes our successes that get us all jacked up. So just community and conversation is huge among leaders because if you’re alone in your own thoughts, you can go crazy. Rich – Absolutely and I think a lot of times church leadership, I know I can identify this in my own world, it can be a fairly isolating experience. You look around and you’re like, “I can’t really talk to the people in my church, I have a hard time doing that. They’re coming to me all the time with their problems.” How do church leaders, how do pastors develop relationships with other safe folks, folks that love them but I love what you said, aren’t impressed with them? Folks that are like, “Hey, these are people that care for me but at the end of the day they know I’m human,” how do you build those relationships, what does that look like? Dino – It’s risky and you’ve got to put yourself out there. They’ve got to be spirit led, they’ve got to be a little bit of kind of, it’s got to have a covenant feel to it where, “Hey, we’re in this thing, you’ve got blood, I’ve got blood,” it’s reciprocal and this whole waiting on someone to mentor, that isn’t going to happen. Dino – “I better connect. I better step out of my closet and connect with someone and not be isolated.” I used to serve, back in the day when I was a whole lot thinner, a whole lot younger, and we always had a rule; my dad and mom, I could go surfing at 5 in the morning, I could surf almost until dark, they had one rule, “Don’t surf alone, don’t surf alone.” The tides, the current, the sharks, the crazy, it’s just too risky and I think sometimes you could pastor, if you’re pastoring alone, you don’t want to plant a church alone. So I think you’ve got to be able to put yourself out there, you want to be able to not be afraid to risk and I think there are people out there, there are big brothers that want to connect, so I think you’ve got to pursue it, you can’t wait on it to come to you. Rich – Why don’t we talk about both sides of that conversation? Let’s say, you’ll put yourself in their shoes, let’s say it’s a young church planter, maybe it’s a young leader in a church and today they’re sensing they’re a bit alone, how do they start that conversation with a big brother? What does that look like? How would you suggest they even begin that? 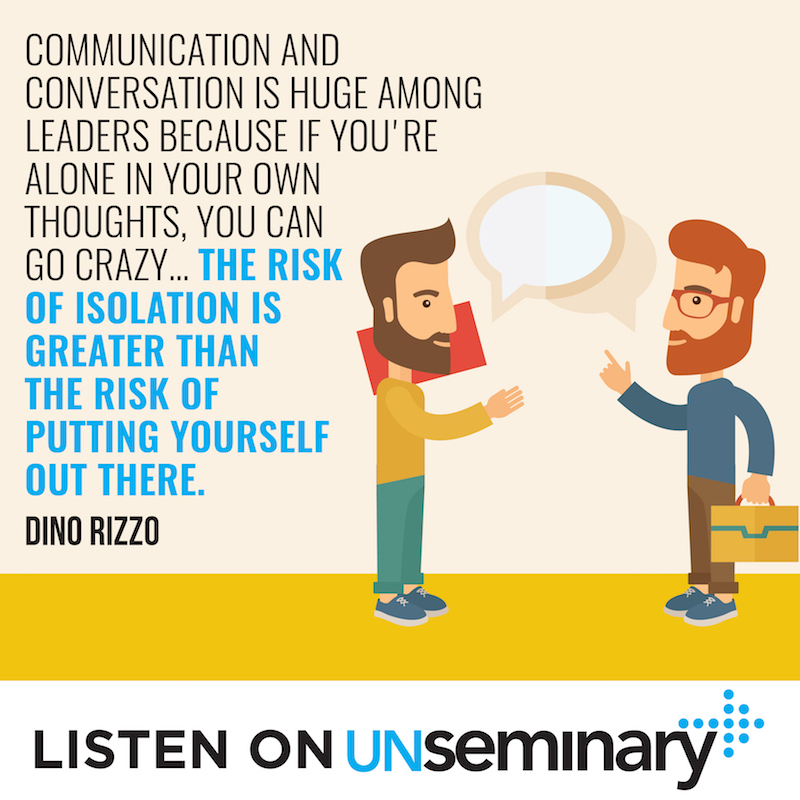 Dino – I would find out someone that I think cares about me and loves me and loves my family and doesn’t love me for what I can do for them or doesn’t love me because of some ministry success and I would call them and go to coffee with them and have conversations with them and try to relationally connect with them. If I’m someone who wants to do that then I would look around and kind of see, is there a spirit born connection? Is there people that God has put in my life that I feel a responsibility to, to reach out to them? I think you’ve got to take steps. You’ve just got to get out of the boat and take steps and know that the risk of isolation is greater than the risk of putting yourself out there. So it’s just huge and important and I’ve seen the pain of it in my own life, when I was isolated and the consequences of that and I’ve watched that with buddies and it’s better to not surf alone. Surf in a pack, find a squad. Rich – Nice. Now what does a healthy rhythm for you look like these days? Obviously a part of this is getting your life pattern into a healthy rhythm for yourself, what does that look like in your life and what do you suggest for other pastors or leaders? Dino – Well I’ve learned a lot and I’ve learned a lot from my pastor now, Chris Hodges. He’s very healthy and with a growing church like it is and the demands that he has on it and watching what’s happening around here. I was not good at it for a long time to be honest with you, I just ran hard and never said no and probably was a little unhealthy on approval addiction and just yes to everything. I don’t think it was out of being wicked, I think I was consumed with helping the poor and making a difference in people’s life and it was that old school kind of youth pastor, die for the cause. Dino – I was dying for the cause alright and so was everybody around me. So here’s what I do now. I don’t let technology rule my life, there’s a time when I put the phone down and there’s a time to not let your… because we’re the first generation that has a whole world in one device and that’s tough. I sleep, there were times when I had horrible sleep patterns and I didn’t sleep and I stayed up way too late and I didn’t get enough rest. When you don’t sleep well you don’t have good thoughts. A matter of fact, if you’re sleep deprived you can have irrational thoughts about people and things that you’re doing and even yourself. The other thing that I do is, I have honest conversations now, more than ever, very transparent conversations. I think I have ranked things differently in my life of what is true success as it relates to my wife and my children and deep friendships. Being about to sit on the back porch and drink a cup of hot tea. Being able to read. Learn how to do nothing for the sake of just rest. So I think I’ve learned how to rest. I’ve learned how to chill. I don’t overreact like I used to. I lived very overreacting for a lot of years and I see a lot of guys doing that today, they overreact a lot and there’s just not a subtleness and a peace. At the end of the day we have to believe in the sovereignty of God, know that God is sovereign and we’ve got to have healthy rhythms. I have a couple of guys in my life now that help me with that, with my calendar, because my calendar can get crazy and then I kill all my margin, I have no margin. So the engine never rests and it’s hard to work on a hot engine. Sometimes the engine has to cool and I never let my engine cool. Then I have a couple of, kind of a coach, counsellors that I speak to about once a month and we ask questions about my rhythm. Rich – That’s very good. There’s a lot packed in there. I hope if you’re listening in, I know there’s a lot of church leaders that find themselves tired today. A friend of mine talks about being dangerously tired and just actually unplugging and saying, “I’ve got to slow down, at the end of the day it’s the Lord’s church, it’s not my church,” and it will go on, even if we turn off the phone and go to sleep, for sure. Now what would you say, maybe there’s a church leader today that senses, “Hey, I think things are a bit out of balance, but I’m not sure what first steps to take to kind of get life back in balance,” what would be some of those first steps they could take? I know that there was a time in my life where I realized that all of my prayer and all of my prep was for presentation sake and if all of your prayer and all of your prep in your spirit and soul is for presentation sake, then you’re going to end up with a vast deficit in your soul. So do you ever spend some time in worship? Do you ever spend some time in meditation? Not for leading, just for loving God, that’s a good place to start, I’m telling you. At the end of the day, I think one of the things that I’ve learned at Highlands, that I think has helped me become more healthy, is just old fashioned prayer, man just, “Do I have time to spend with God?” If I don’t I am headed for a train wreck. Rich – Very true. Just changing gears a little bit, you’ve really been a leader in combining both service and evangelism together. I think there was a false dichotomy for too many years between kind of the proclamation and the demonstration of the gospel and I think you’ve really been a leader in both thinking and kind of pushing churches to think that way, which I appreciate that and I just thank you for that in all the ways that you’ve done that over the years. What is your current thinking on how we should be serving our communities, community transformation and what does that look like? Where are you at with that these days? Dino – Well I’m still dedicated to it and one of my roles here at Highlands is I oversee all of our outreach at all of our campuses, local and then also national with ARC and that thing we do, Come Grow and then also with international. So I love how you said proclamation and demonstration, you nailed that one my man, I’m going to steal that one. Rich – It’s not my idea so go ahead, please use it. Dino – Yeah, those are great bookends for the gospel. I didn’t start out, “Okay, we’re going to do this,” it was because of where we were serving in Louisiana, you just were dealing with a lot of people that were struggling and they were having hard times. So we just realized that we needed to be the hands and feet of Jesus. They’re not going to hear us unless they see us. It’s not going to touch their heart if it’s not touching their lives. So we were kind of forced, I think God put us in a spot where we had to merge the two, there wasn’t a choice and out of that I just really began to see, all throughout scripture, that I just believed it was the way of Jesus; just living people, being out in the community, he was there, he was among them, he was touching, he was caring, he was noticing. I think it begins with noticing, that’s a big important word I believe. If you’re going to impact a community, if you’re going to see people come to Christ, you’ve got to notice what’s happening around you, you’ve got to notice the pain, you’ve got to notice the crap, you’ve got to notice the tragedy and the heartache of what’s going on around you in your community. I think there’s a lot of ways to do that, it’s just keeping your head on swivel when you’re out, looking at your local newspaper or local paper online. It’s just knowing what’s going on, who’s taking their life, what type of domestic violence is going on, who’s hungry, what schools are failing, what people are falling apart, what type of addiction is going on and just, “Lord, how can we be the hands and feet of Jesus?” I don’t think it costs a lot of money, nor does it take a lot of people, I think one person can make a difference. Rich – Man, I appreciate that. Is there anything else you want to share before we kind of pivot into the rest of the episode? Rich – Not Dr. Dino Rizzo coming in? That’s amazing, that’s great. Dino – Anyway, it’s kind of fun. This resourcing yourself is the difference to me, at leadership. You’ve got to resource yourself, you’ve got to learn, learn, learn, learn, learn, learn.